I count myself lucky to be excited about September each year, and this is due mainly to… well yes, flamenco! My dance and rhythm classes resume, and the calendar fills up with fantastic flamenconess around Madrid. And here are the flamenco events that most excite me this year – and some of them are free! Which is great news for those of you whose bank account is running low after their summer holiday. Plus you get to visit a castizo neighbourhood in Madrid where you wouldn’t necessarilly go otherwise: Vallecas! 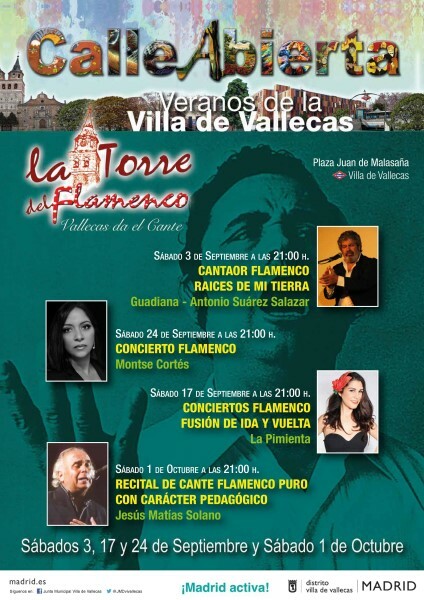 The La Torre del Flamenco festival has an excellent flamenco singing and guitar programme running on the 3rd, 17th and 24th of September and on the 1st of October at Plaza Juan de Malasaña. Bus SE2 departing from Atocha will get you very close to it –just hop off at the last stop! And remember: it’s free! If you’re in the mood for some inspiring and exciting live flamenco dance, you can’t miss bailaores José Jurado and Isabel Rodríguez, accompanied by fabulous singing and guitar at Las Carboneras tablao at the very central Habsburg district, every day until the 15 of September. Tickets are €36, and they include the show and a drink. If you’re keen on seeing some excellent flamenco singing and guitar, then the Sala García Lorca at Casa Patas is your place: check out their October programme and if you’re around in Madrid in any of those dates, lucky you! Shows are around €25. Ea – now you only need to pick and book!